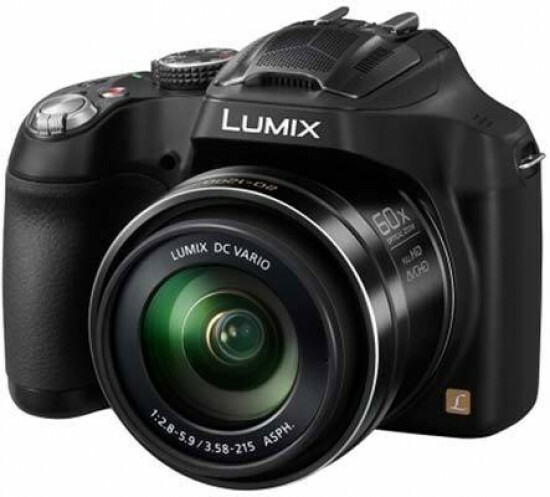 The Panasonic Lumix DMC-FZ72 (also known as the FZ70) is a digital bridge camera with a 16.1 megapixel high sensitivity MOS sensor, FullHD video, Power OIS and a 20mm wide-angle lens that telescopes out to an unbelievable 1200mm. That's a 60x zoom and is currently the longest in the industry. In this in-depth review, we test how the camera performs at these extreme lengths. The Panasonic Lumix DMC-FZ72 costs around £365.99 / $399.99 and is available in any colour as long as it's black. Perhaps the most surprising aspect of the Panasonic Lumix DMC-FZ72 is the size of it. We half expected a camera the size of a mid-range DSLR with a zoom that size on it. However, it's not actually that bad. Sure it's a little bit bigger than a bridge camera that features a smaller zoom range, but that's to be expected. The design has been given a rework with smoother corners, a chunkier grip and adverse angles on the top where the hotshoe is located. Couple that with the built-in microphone and speakers on the top of the pop-up flash and it looks quite futuristic. Typically, for a bridge camera, the controls and buttons are slightly more over-sized than what you'd see on a digital compact camera. But then that's what happens when you have more estate to play with. The large command dial sits on the right shoulder nestling against the Live View Finder (LVF). The power switch sits under it. Surrounding the command dial as if defending the shutter release are the direct video, continuous shooting and focus option buttons. The Panasonic Lumix DMC-FZ72's zoom is operated by the rocker switch around the shutter release. Panasonic should really have thought about placing a separate zoom switch on the side of the lens barrel. It's a lot easier to use when supporting the lens at full zoom. That's not to say that it's difficult to use and we found through testing at full zoom that we generally got sharp pictures as long as we kept the ISO setting to auto and let the camera do its thing. It's programmed to keep the ISO as low as possible and the Power OIS (Optical Image Stabiliser) will ensure that it does. Panasonic use two different types of OIS: Mega and Power. The Power OIS is fitted to the FZ72 because it's twice as good at suppressing shake than Mega OIS. It's designed to help with low light such as night scenes without a flash, but can also help with high zoom ranges due to the reduction in light from the narrower field of view. For the keen photographer there are a number of features that will appeal. The command dial on the top plate of the Panasonic Lumix DMC-FZ72 has manual PASM modes. The back of the camera has an AF/AE lock button for creative light or focusing techniques and you can also record in raw, JPEG and both at the same time. There's a hotshoe for fitting external flash and an LVF (Live View Finder) for holding the camera up to your eye as you would with a DSLR or CSC. This brings the camera into your centre of gravity and stabilises it which is useful if you have the zoom at full length. Typically on a camera of this price range and filled with this amount of tech, the build quality is very good. It's solid to hold and feels great. As we mentioned previously, the grip is a little more chunky than we normally find on a bridge camera and while we think that it may simply be a happy accident, it certainly helps when shooting as you feel that you've got more to hold onto. Bigger is certainly better with a bridge camera. Despite the plastic exterior, the Panasonic Lumix DMC-FZ72 feels solidly built. The battery door is strong with little play when it's fully opened. The spring loading of the door is powerful and it snaps open. Thankfully a lock is provided to prevent it opening by accident. The tripod bush is located just next to the battery compartment and is slightly off-centre. We'd normally poo-poo that idea but it's obvious that it's been done to make room inside for the lens. The tripod bush is made of metal, which is great. Let's face it, with a zoom lens like this, you'll want to take your time to use a low ISO. From a cold start, the typical start up time of a digital compact camera is around 2.5sec. The Panasonic Lumix DMC-FZ72 blows all that out of the water. We switched the camera on, focused it and took a picture in 1.3sec. That's an astonishing time and moving into DSLR territory. There are five continuous shooting modes. The slowest is the 2fps (frames per second) mode. It's a continuous mode and not a burst. It does start off faster at the beginning, but it slows a little after around 4-5 sec. We managed to get 17 images in a ten second period which is an average of 1.7fps. It does shoot at 2fps for the first 4 seconds before that noticeable drop in speed. Next up is a 5fps burst mode. It rattles off the initial images, then slowly plods along at a continuous rate of around 1fps. Unusually, we only recorded 4 images taken over a 1sec period. Both these settings come with a continuous AF option. Scream if you want to go faster because the Panasonic Lumix DMC-FZ72 has a 9fps setting at full resolution. However, in our tests, the camera stopped after 3 frames. This is where it gets a bit pedantic about what the manufacturers are labelling their products with. You see, the camera takes three photographs in around 0.3sec. That means if the camera DID take nine photographs, it would manage it in one second. That means it's a 9fps SPEED, not a 9fps RESULT. It's a bit misleading and either the buffers should be bigger to cope with nine frames of information, or they should find another way to display it. If you want 9fps, you need to choose the next setting, but that only records at 3 megapixels. Because the Panasonic Lumix DMC-FZ72 uses a power switch and not a power button, you can't preview images you've taken without switching it on first. The image will be full size in the screen with no information around it, so you can see it in all it's glory. You can press the DISP button to bring up various amounts of information such as the file size, number and picture style. Press up and you can enter a Retouch area which allows you to add the digital effects to the picture if you forgot to do it while taking the shot. Pressing the DISP button again will add a little more information to the screen before scrolling back to no information. In the box, you get the camera, a dedicated lithium ion battery with charger, CD software that features PHOTOfunSTUDIO 9.2 and a trial version of LoiLoScope video editing software. There's also a neck strap, lens cap and a basic owner's manual to get you started.